I'm getting the Mossy Oak camo rocker panels. Its going to be the new Break-Up Infinity 12 inches by 22 feet and the camo Z71. Problem is it states you need to install it in a garage out of the sun that's at least 60 degrees and leave it there for 12 hours. All of that is no problem except for it's much colder than 60. Does it really matter that much? Love the truck! Those are the 35s right? Did you notice a big difference on mpg from 35s to 37s? Did you regear it also? Yeah I think im going to go with a Performance lift for like $280. It comes with everything except the gap covers. And do you have any pictures of when you had your truck? What is a cheaper but still decent quality body lift? How much is a 3 inch body lift i only know about the suspension lifts. I have an 05 silverado with a 6 inch suspension lift and 35s. 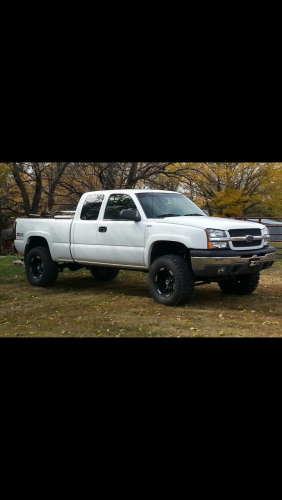 Its a Z71 so it does set a couple inches higher than the 2wd. I've been thinking about putting a 3 inch body lift on to get my truck the distance of setting pretty high. The thing is my gas milage is bad enough and I don't wanna run 37s because of this and I don't want to regear. Would this setup look bad? Would the tires be to small? Pics would be nice but iv searched around and not finding a whole lot. Alright thanks everybody for the help! I'll order them soon and put them on. Also do you guys like the 36 inch decals on the back window that are a chevy bowtie? quote name="kstruckcountry" post="1377422" timestamp="1385582233"]IMO it would look best without any, but it's your truck, if you like them put em on. I like the clean look on black trucks. Do you think a white truck will look better with those on it then the stock red ones? So is it very loud though? What about just driving around town?